India has a number of excellent science institutes - sometimes IITs are not the only options. As we all know, JAM 2020 is the most coveted MSc entrance exam with highest number of appearing students in this segment i.e. 55,000. The exam is quite competitive in nature and the selection ratio is also less than 4%, roughly equating to 1 in every 25 candidates. Considering the fact, the intake of MSc and Integrated MSc programme candidates is only 2,104 in IITs and IISC for 2019. 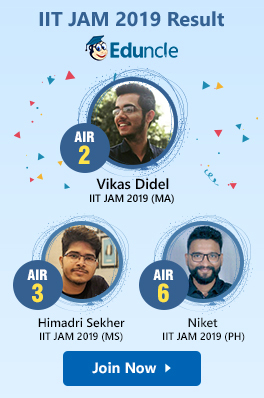 It’s no wonder that when IIT JAM Result declares, it breaks many hearts who couldn’t sail through it. Every year the level of difficulty is different and so are the ranks/cut off marks. If the paper is easy, then the chances of higher cutoff soars. While IIT JAM Toppers go for top-most IIT JAM Colleges, the candidates with low-rank can get admission in remaining institutes. The reason why IITs are top pick is hype created about these institutes, reasonable fees, scholarships offered and future aspect. Owing to a smaller number of seats in IIT JAM Admitting IITs like IIT-B, IIT-D, IIT-Roorkee, IIT-KGP etc. despite having a decent rank, some students can’t get admission in their desired IIT. IIT JAM 2018 Physics Topper – Swarnim Shirke opted for IIT Bombay. IIT JAM Geology Topper – Rahul Pandey also ticked on IIT Bombay for M.Sc. IIT JAM Chemistry Topper – Amardeep Kumar also enrolled into IIT-B. NIT – National Institute of Technology are the second greatest institutes for pursuing M.Sc. Most of the NITs offer M.Sc. in Physics, Chemistry and Maths by accepting JAM Score cards. There are overall 20 NITs that accept JAM scorecard and the admission process is known as centralized counseling for M.Sc./M.Sc. (Tech) CCMN. IISc – Indian Institute of Science, Bangalore is one of the eminent Science and research institute in India. It is the only Indian institute among top 100 QS world ranking and 1st at NIRF ranking. IISc offers overall 20 seats for Integrated M.Sc. PhD courses in Mathematical science, Chemical Science, Physical Science, Biological Sciences. IISER - Another great option for pure sciences and research is the Indian Institute of Science Education and Research. The Indian Institutes of Science Education and Research (IISERs) are a group of premier science education and research institutes in India which are centrally funded. Total Number of Seats in IIT JAM for IISERs: There are total 12 seats in 2019 session in IIT Tirupati. IIEST Shibpur - The Indian Institutes of Engineering Science and Technology Shibpur offers admission to M.Sc. course through IIT JAM for its 50% seats. Total Number of Seats in IIT JAM for IIEST: There were total 80 seats in 2019 session for M.Sc. programme in IIEST. SLIET, Punjab - Talking about the deemed university, Sant Longowal Institute of Engineering and Technology which is located in rural backdrop of Punjab, offers admission to M.Sc. courses through JAM. Interestingly, this institute was established by MHRD in 1991 and it has a good repute among Science peers. After completing M.Sc. in one of the above institutes, candidates can choose to opt for higher studies like doctorate and Post-Doc in foreign universities. Although IIT JAM is one of the most sought exams in India, there are some other top science exams to pursue after B.Sc. too. These exams can be your alternatives to forge successful career in the domain of Science. One must not lose hope just because they didn’t make through a test to enter IITs/NITs. Unable to gain admission into IIT, doesn’t mean the end of academic road for students, not in the least. India is home to a number of universities of repute that offer programmes in almost all disciplines. Apart from the courses, these universities also have the attraction of the best of infrastructure and co-curricular activities. So, whether you make it through IITs or not, head over to IIT JAM Exam now! The days are getting shorter, and JAM preparation is becoming more and more intense as the beginning of online registration with September fast approaches. 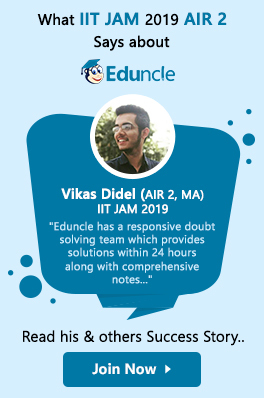 The search for the perfect IIT JAM Study Material seems never-ending, but maybe — just maybe —Eduncle has figured it out. We have just launched a JAM Preparation course, which includes a perfect study formula that prepares you well to score higher and can work for all students. The best part? 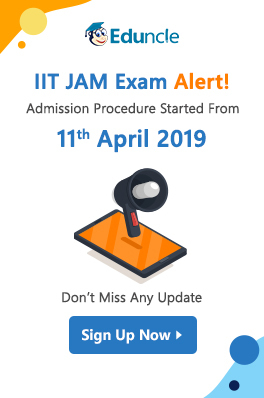 The it is updated by IIT JAM Toppers and qualified faculty members and is available all across India. You'd be hard-pressed to find a better-study material, folks. If you use a computer for IIT JAM Preparation (who doesn't these days?) you might want to scoop this one up. 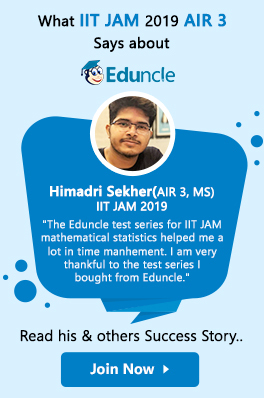 Call us on 1800-120-1021 to know how to crack IIT JAM Exam? Sign up for Eduncle Study Material! If you’ve any queries regarding IIT JAM Exam or Ranks vs Marks analysis. Drop us a comment below!